Zero electric bills - How many solar panels? Is solar power cost effective for you? Compare the capital costs of setting up solar power versus the expected long term returns. What is the solar energy received at your location? For remote systems how much generator fuel will be saved with a solar system? How close to the perfect aspect and pitch is the mounting for the solar panels? Is there a feed in tariff for your area? Is it based on net or gross alternative energy generation? What is your current electrical consumption? Will the solar system generate an income? Fill in the top table, click the Get Result button and review Results table. Total size of Solar Panels in metres squared. E.g. 6.4 for 1000 watts of panels. Work out total solar panels area calculator. Press this button after adjusting values in the top table. Results are in the lower table. Is the cost per kWh generated from solar less than your existing electricity provider? Does the solar system create a good profit with feed in tariff? Does solar power have a good return on investment? How much will a solar power system save you? The best aspect for solar panels is facing the equator (Northern hemisphere face south, Southern hemisphere face north). The ideal pitch angle equals to your location latitude. Could a community based solar power system be more cost effective? Share the installation costs on a community building and share the profits. 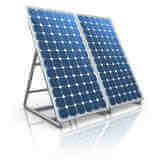 Earn a solar income independent of your residential location. Calculate all possible energy efficient and alternative energy activities and see which ones are easiest to implement and get the best return on investment. Losses in the inverter, wiring and solar panel temperature coefficient. Total Solar generated at current electricity costs. Total Solar generated at current electricity costs - installation cost. Total Solar generated profit at current feed in Tariff - installation cost. Solar power system return on investment (ROI) per year for its lifespan. Solar power system with feed in tariff return on investment (ROI) per year for its lifespan. Does the calculator reveal a worthwhile project to pursue? Is solar generation power cheaper than your current provider?